The frosty winter in a thick mist, natural scenery and undulating roofs hidden under the white mist create the mysterious beauty of the three romantic misty city: Sapa, Dalat and Cao Bang. Explore the small corners of these 3 cities to see which attractions have caught visitors. With a cool year-round climate, Dalat is the destination that most tourists choose for summer vacation. 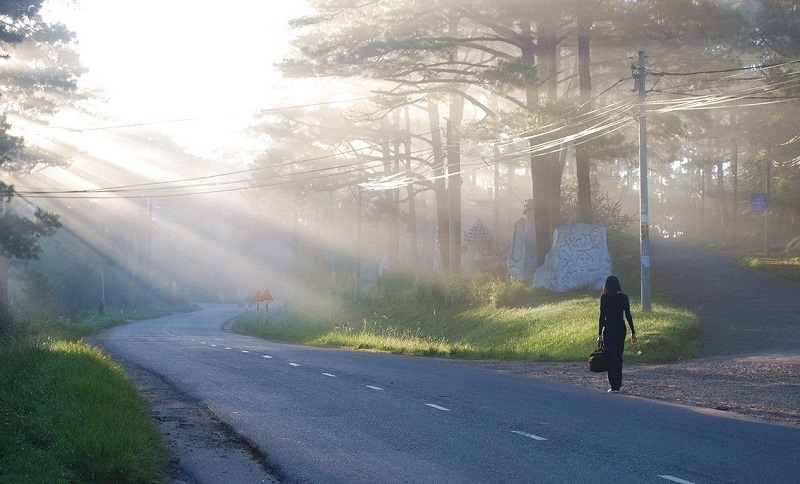 In this season, Da Lat is attractive tourists by the weather of the four seasons on a day. 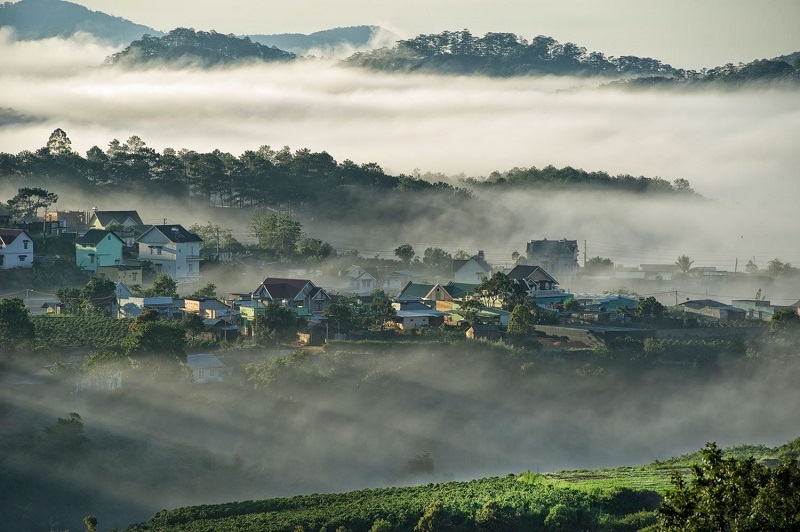 If you wake up in the early morning, standing from above look down to see the white mist floating, you will think about the beautiful paradise that exists in the heart of Da Lat. The morning mist always prefers to leave on the leaves of pines around Xuan Huong Lake. The green trees, clear water in the lake give you a feeling of cold and peaceful. In addition to Xuan Huong Lake, City Flower Garden, an unforgettable destination for early morning mourning is Cau Dat Tea Hill – about 25km southeast of Dalat city center. The deepest morning mist is from April to May. In July to the end of August, visitors can see the mist in the early morning and late afternoon. From the top of LangBiAng, look down – this is a beautiful place to enjoy the feeling of floating on the “cloud” made of the mist. If Da Lat is a dream destination for you to feel cold in the early morning, Sa Pa brings another special experience, you have a chance to experience the strong cold of this mountainous town. This is all about Sa Pa frost all year round, the temperature here can drop below 0 degrees C, the cold weather of the northwestern land. 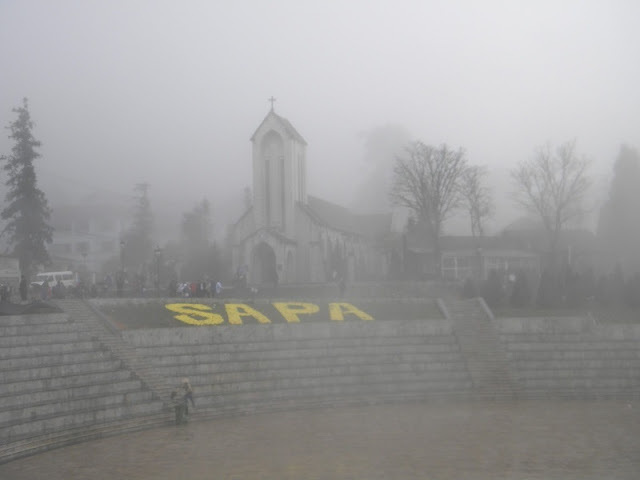 Coming to Sapa this season, tourists can admire the misty scene also enjoy the fruits peach and delicious Ta Van Red Plum. The small peach digging type of forest and night due should eat a crunchy, sweet bar. The red plum is also used to desert fruit or eat desert can also soak the wine, alcohol after soak drenched strange taste. Ban Gioc Waterfall in Cao Bang is the fourth largest border waterfall in the world and the largest in Southeast Asia. In addition to visiting the famous sites of Cao Bang Nguom Ngao – 3 km from Ban Gioc waterfall, Thang Hen Lake with two sides up and down interesting; visitors can also reward themselves specialties here such as Pho Chua, fish in Thang Hen Lake, sour bamboo shoots, Bao Lac plum. Take the Vietnam package tours to discover the most interesting places in this unique place in Vietnam. Have a happy and meaningful holiday!